What is a Post Representative (Post Rep)? 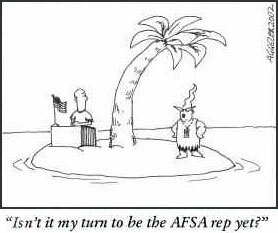 AFSA is a professional organization, with chapters in most countries and informal groups in many bureaus and offices. These groups are led by Post Representatives, active duty Foreign Service employees who donate their time to assist fellow employees with management-related problems and professional concerns. They serve as a liaison with AFSA and pass on the views of its members in all the foreign affairs agencies. The AFSA Post Rep represents both the collective and individual interests of the Foreign Service personnel at post in dealing with post management. What Do Post Representatives Do? Acting as the AFSA point of initial contact for post members experiencing particular difficulties which may lead to a grievance action. Distributing throughout the bargaining unit any information of general interest that AFSA Headquarters sends to post. Forwarding to AFSA any proposals, complaints, or criticisms originating with the bargaining unit members at your post. Representing the members of the AFSA bargaining unit in dealing with post management on matters of general interest. Building AFSA's membership and raise AFSA's profile at post. Maintaining current membership lists and periodically forwarding it to AFSA Headquarters. Housing: orderly and just allocation, and housing board policy. Overtime: this may vary as legislation and regulations change. Rosters for duty officers, duty office management specialists and duty communicators. Commissary associations and commissary management. Job descriptions and greater responsibilities for office management specialists. Visit the chapter manual for additional information.